A group of McGill students slept out in the rain last night, and more will be sleeping in the great outdoors every night this week. No, it’s not a case of shortages in Rez. These urban campers are roughing it by choice. The students are participating in the nationwide 5 Days for the Homeless campaign from March 10-15 to raise money for Montreal’s Dans la rue, a grassroots, community-based organization that works with street kids and at-risk youth aged 12 to 25. A group of McGill students slept out in the rain last night, and more will be sleeping in the great outdoors every night this week. No, it’s not a case of shortages in Rez. These urban campers are roughing it by choice. The students are participating in the nationwide 5 Days for the Homeless campaign from March 10-15 to raise money for Montreal’s Dans la rue, a grassroots, community-based organization that works with street kids and at-risk youth aged 12 to 25. The campaign started at 5 p.m. Sunday and concludes at the same time Friday, March 15. The 5 Days campaign’s goals are to increase awareness of the issue of homelessness and to raise donations for charitable organizations supporting homeless and at-risk youth across the country. 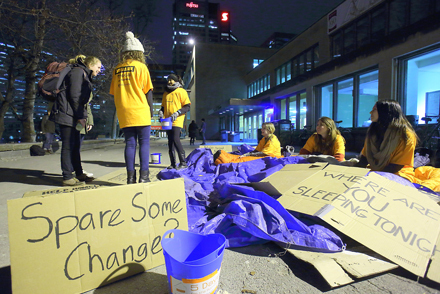 University of Alberta School of Business students founded 5 Days for The Homeless as a local initiative in 2005. The campaign went national in 2008, with a McGill team joining the effort. To date, the campaign has raised over $950,000 and has spread its message from coast to coast, with students from 26 Canadian Universities and colleges are taking part in this year’s edition. Over the course of the week, participants are required to remain on campus for five days with no income, personal communication devices or access to showers. They have to sleep outside with only a pillow and a sleeping bag and can only eat food donated directly from passersby. They also must attend all their regular classes and keep up with their schoolwork, and are expected to write about their experiences at the end of the campaign. The McGill group consists of five committee members – all returnees from last year’s campaign, and 30 volunteers. After a dry and mild first night spent in their base camp outside the Redpath Library, Monday night’s group of sleepers couldn’t quite manage 40 winks, a steady rain soaking their sleeping bags and rousing them in the early morning hours. The McGill team collected over $1,250 in the campaign’s first 24 hours on its way to a goal of $15,000. For more on the 5 Days initiative, and to make a donation, click here. What this group is doing is to be commended. I hope the goal is reached! It’s heartwarming and fantastic work these students are doing. Best wishes that you reach your goal! I can’t really applaud this initiative. Seems more like a marketing ploy than a genuine effort to help the homeless. awareness” to an issue and promote their university. Why not address the market mechanisms which allow homelessness to exist in the first place…..oh that’s right, that kind of rhetoric runs against the grain. Just give your annual donations in perpetuity….don’t resolve anything.